The Malone Handirack Inflatable Roof Rack is simple to use, installs in seconds and can securely carry your stand up paddleboard, kayak, surfboard on any vehicle. 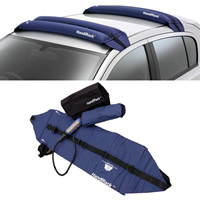 Inexpensive and effective, the Handirack packs down to the size of a toiletry kit so you'll have a roof rack anywhere you want to vacation. This is the coolest portable car rack available. When traveling to a foreign country you no longer have to pay extra for a rental car with a rack. The little Handirack turns any vehicle into a work truck. *Not to be used on vehicles with side curtain airbags.